Joel remarked that this picture looks like something from Gondor. Sweet! I'm being compared to Tolkien!!!! I once heard the description 'pretty poverty' applied to the Nativity. I think that this is a very apt description. We have somehow conjured a picture of a smiling Mary sitting on a pile of clean yellow straw, holding a laughing infant wrapped in a spotless white blanket. They are usually flanked by a serene Joseph and a few smiling cows and sheep. Some freshly washed and brushed shepherds kneel adoringly, while wise men (who aren't supposed to show up 'til Epiphany), present their gifts. Why are there always three wise men? Why aren't they kneeling in manure piles? Several people have told me that they tried to post comments on my blog, but were unable to because they did not have a blogger account. I think that I now have it set up so anyone can post comments. Let me know if it works! Added later: You have to select 'anonymous' when you select your profile. Hope that makes sense! It worked when I tried it. On Thursday, we got the sad news that Samantha Wollbrink's grandmother had passed away. The funeral was today, and Mom and I decided to go. Dad and Richmond had to help out with a work day at church, so we 'girls' were all alone when the funeral service ended and Mom had the sickening realization that she had locked her keys in the car! We called Dad's cell phone repeatedly...no answer. Apparently, Dad had left his phone in the truck. We called Papo, and he agreed to come out and pick us up. So, while everyone else left to attend the graveside ceremony, Mom and I stood by our little Scion, eyes strained for the first sight of Papo's car. Minutes dragged past. People drove up and stared at us as they stopped at the intersection. Our position was begginning to get uncomfortable when Mom saw a man pulling into the fire station across the street. "That guy looks like Joel. Maybe the fire department can get our door open." She said. 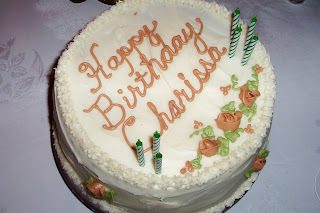 On Thursday night, we had a birthday supper for Charissa. Mom cooked up a delicious meal of chicken valentino on tortillini noodles. Dessert was carrot cake with cream cheese frosting. Yum! There was a debate as to what kind of glasses these are. I think they're balloon glasses, but my knowledge on such matters is, at best, sketchy. No get-together with the Coyles would be complete without a game of Canasta. Joe and I won!!!! A thoughtful birthday girl ponders her next move.